Antarctica is no longer a 'pole apart'. From a scientific perspective, the Antarctic ice sheet, ocean and climate systems are intimately linked with the global climate and are now seen to be of international significance for understanding climate change. From an economic perspective, the Antarctic is perceived to have great potential as a source of marine resources although the extent of speculated mineral and hydrocarbon resources is unknown. From a conservation perspective, the continent of Antarctica represents the ideal image of unspoiled wilderness. 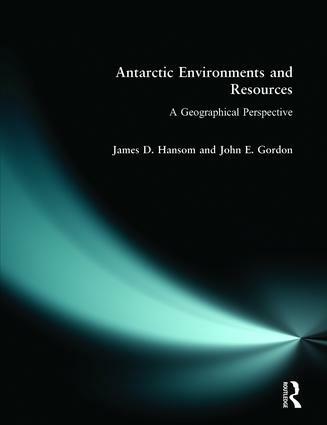 Antarctic Environments and Resources is an accessible and timely new geography of the Antarctic which examines the differing and sometimes conflicting interests in the great southern continent, the Southern Ocean and the subantarctic islands against a background of the physical and natural systems of the region and their interactions. It charts the development of human involvement in the area, focusing on the exploitation of resources from early sealing to modern fisheries, tourism and science, and it assesses the consequent impacts on the natural environment. The text also reviews the emerging framework for future environmental management developed under the Antarctic Treaty System. This is an ideal text for undergraduates studying glacial geomorphology, environmental management, polar regions and the Antarctic. 7. Environmental Impacts: Antarctic Resource Exploitation.